DESCRIPTION: A pretty thing, I think, with nicely colored eyes. The Yellow Rat snake is one of the most popular snakes to keep as a pet. They are harmless regarding their venom, but they are able to deliver a nasty bite. While these reptiles do not have venom, it is still important to have your snakebite checked out by a physician. 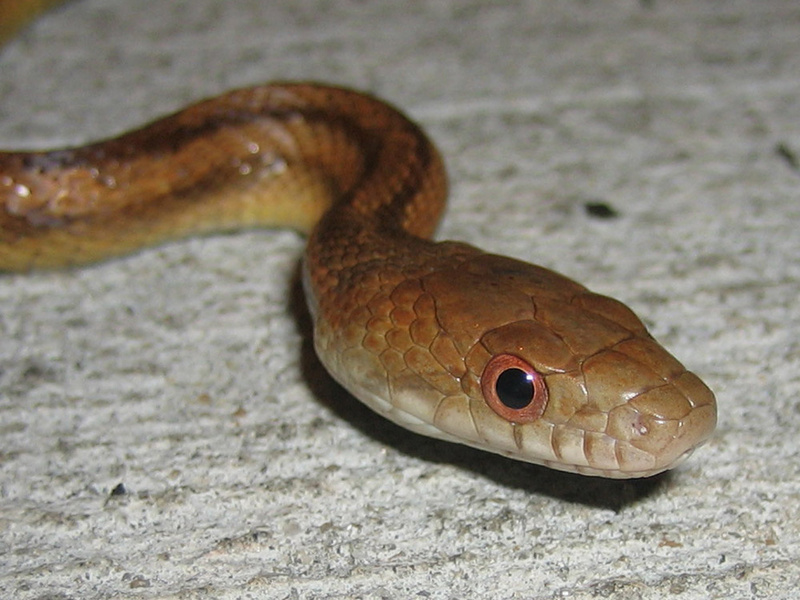 The snake may have consumed a disease carrying rat before it distributed its bite and that can be very dangerous to a human. Yellow Rat snakes are able to grow to four to six feet long, so you will need a terrarium that is at least four feet by four feet. Most people prefer to have a Yellow Rat snack that was born into captivity as opposed to captured from the wild. These snakes are able to become more docile after being continuously handled, but ones that were born in captivity all usually the most docile. You should make sure that your snake has branches to climb, as well as a large pan that allows your pet to bath and soak in water. You are able to use most substrates for this type of reptile. Most people prefer newspapers as they are easy to clean and cheap. Yellow Rat snakes are the easiest reptiles to feed as they prefer rats. You should feed your snake rats that were purchased from a pet store as opposed to being caught in the wild. These snakes use their coils to squeeze their prey prior to consumption. These snakes are sometimes difficult to identify in the wild, this can be a very dangerous mistake. Because of this, it is highly recommended that you purchase your snake from a breeder or pet store. These snakes are often found in farming areas as they enjoy hunting rats. Farmers appreciate having them around due to this reason, as well.